One of the neat things of being in a CSA (Community Supported Agriculture) farm share is the seasonal influx of new-to-me veggies. I'd known that radishes existed of course. I'd seen them on salad bars or on salads I'd order in restaurants. I assumed, based on that brief taste, that I didn't care for radishes. The first year we got radishes in a farm share, I gave all of the radishes to my dad. The second year, at the spring "welcome to our CSA" gathering when we picked up the first box of the season, I sampled a French Breakfast radish dipped in salt. Hello! That's good eating. After that I started sharing the radishes with my dad. 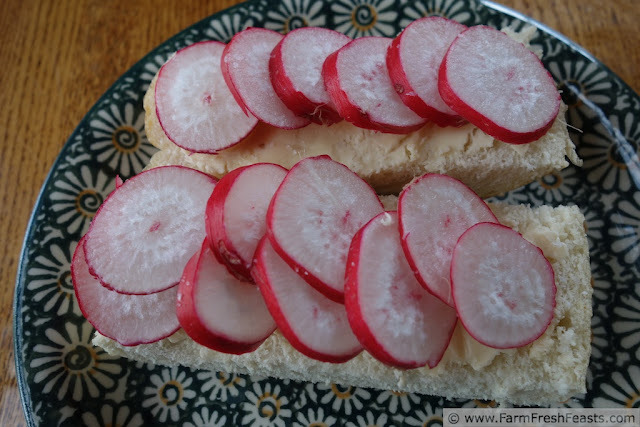 My favorite way to eat a radish remains the simple radish sandwich. Take a slice of good bread (La Brea Bakery Whole Grain loaf from the store or Costco remains my favorite). Spread with butter or buttery spread. Top with sliced radishes. Sprinkle kosher salt over top. Delicious! I'm currently fermenting some shredded radishes into relish on my countertop. What are you doing with radishes?